The Rivers Edge Outfitters fly fishing staff is hard working, knowledgeable, friendly, and passionate about what they do. With the experience that only comes from spending hundreds of days each year on these Western North Carolina rivers and streams. We have the ability to meet and exceed your needs and expectations. Let our fly fishing guides show you why Western North Carolina is becoming the top location in the United States for fly fishing. Which river should I fish? What’s the best time of year to come to the mountains? Simply pick up the phone or send us an email and one of our expert staff members will be glad to assist you in your fly fishing vacation planning. With so many great streams to choose from, many times your best bet is to make your fly fishing plans based on what time of the year works best for you and leave the rest to us. Join Rivers Edge Outfitters for a guided fly fishing float trip. Float fishing is one of the best ways to enjoy fly fishing while at the same time enjoying some of Western North Carolina’s most magnificent scenery. Experiencing fly fishing from a drift boat can provide exciting opportunities to reach remote parts of the river not accessible on foot. We use the very best boats in the industry. Fiberglass drift boats provide the ultimate in comfort for our discriminating clients, while our Creek Company rafts offer handling and safety features not found on normal rafts. Enjoy a 1/2 day of floating for some of the greatest fishing action around. Fish for these beautiful trout and smallmouth and have them pull drag off your reel. Whether you are an experienced or novice fly fisherman or spinning tackle fisherman, we can meet all your needs. All equipment is provided or you are welcome to bring your own gear. For all levels of experience. Enjoy a full day on the river. We float several river systems here in Western NC. The Tuckaseegee, the Little Tennessee, and the French Broad River are all within a few minutes of our shop. A stream side lunch is provided on all float trips. We leave it up to you to determine the menu. Your guide will contact you prior to your trip to discuss lunch options. All gear is provided, does not include license & gratuities. Full day trips are our most popular trips! All trips are privately booked. You will not be added to another trip. We provide wade and walk fly fishing trips. Wade fishing is a great way for novice and expert anglers to enjoy the bountiful waters we have here in Western North Carolina. Our guide staff closely monitors river flows, water clarity, and movement of insect hatches to put you where the fish are feeding best.The options for wade trips are endless. Trout can be caught on wade trips throughout the year. From delayed harvest streams, catch and release private waters, smallmouth river fisheries, to high elevation wilderness streams, we have access to thousands of miles of trout and smallmouth bass water. With over 3000 miles of wild trout water inside the Great Smoky Mountain National Park, the Daniel Boone Refuge, and the Mt. Mitchell Wilderness area, our guides love to grab a small light rod and introduce their clients to some of our high country, wild streams. The dry fly fishing and scenery is unbeatable, and crowds are non-existent. This 4 hour trip offers great fishing on some of the greatest private water in the entire southeast. This is great water about an hour away from our Cherokee, North Carolina location, located near Clarkesville, GA. This water is approximately 1 mile of the finest trout fishing in the entire Southeast United States. Rainbow, brown, and golden trout roam this stream. Fish in excess of 25 inches and 8 pounds are common at Rivers Edge on the Soque. The Soque River is known Worldwide to produce absolute giant trout. The guides at Rivers Edge Outfitters really know how to put you on giant, trophy fish. Once you have fished our private water you will be begging to come back. 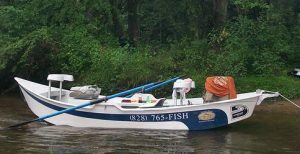 This 8 hour trip offers great fishing on some of the greatest private water in the entire southeast and a stream side lunch right by the Soque River at our secluded picnic area. This is great water about an hour away from our Cherokee, North Carolina location, located near Clarkesville, GA. This water is approximately 1 mile of the finest trout fishing in the entire Southeast United States. Rainbow, brown, and golden trout roam this stream. Fish in excess of 25 inches and 8 pounds are common at Rivers Edge on the Soque. The Soque River is known Worldwide to produce absolute giant trout. The guides at Rivers Edge Outfitters really know how to put you on giant, trophy fish. Once you have fished our private water you will be begging to come back. Always wanted to do a guide trip, but not sure what to expect? Don’t want to spend that kind of money on a full day or even half day trip? Rivers Edge Outfitters is now offering the perfect option. A two hour guide trip. With prices starting as low as $75 per person, this is a great option for beginners and experts alike who want to get on the water but not spend a fortune! Our shop is located within 5 minutes of 5 different trout streams, so you wont spend your whole 2 hour trip driving to your destination to fish. Call us today to take advantage of the new 1/4 day trip option at Rivers Edge Outfitters. For all levels of experience. Fish the local hot spots with an experienced guide. Trout species include rainbow, brown, and brook trout. During the summer months we also fish for smallmouth bass. Typical streams and rivers that we fish on half day trips include the Oconoluftee, Raven’s Fork Catch & Release waters, the Tuckasegee, the Nantahala, Fires Creek and over 2700 miles of wild trout streams. Travel times vary from 5-30 minutes. Half day lessons are also encouraged. This is a great trip for those that do not have time for a full day trip. All trips are privately booked trips. You will not be added in with another group. For all levels of experience. Enjoy a full day on the river. With the full day at our disposal, we can explore a wider variety of water within our area. Generally we will decide where to fish for the day after a discussion of the options with your guide. One popular option is the “High Country Sampler” in which we fish several different streams during the day. This option gives the angler a chance to learn a variety of techniques as well as learning new streams and rivers. Full day trips are our most popular trips! All trips are privately booked. Cancellation Policy : No cancellations within 48 hours of trips (no refunds); only reschedules permitted. For all levels of experience. Fish the local hot spots with an experienced guide. Trout species include rainbow, brown, and brook trout. Trout species include rainbow, brown, and brook trout. During the summer months we also fish for small mouth bass. Typical streams and rivers that we fish on half day trips include the North Toe River basin, the South Toe River basin, Catawba River, and over 200 miles of wild trout waters. Travel times vary from 5-30 minutes. Half day lessons are also encouraged. This is a great trip for those that do not have time for a full day trip. All trips are privately booked trips. You will not be added in with another group. Enjoy a 1/2 day of floating for some of the greatest smallie action around. Fish for these beautiful bronzebacks and have them pull drag off your reel. Whether you are an experienced or novice fly fisherman or spine reel fisherman, we can meet all your needs. All equipment is provided or you are welcome to bring your own gear. Enjoy a FULL day of floating for some of the greatest smallie action around. Fish for these beautiful bronzebacks and have them pull drag off your reel. Whether you are an experienced or novice fly fisherman or spine reel fisherman, we can meet all your needs. All equipment is provided or you are welcome to bring your own gear. Our Private Water offers guaranteed solitude and the chance to catch TROPHY-SIZED trout (up to 30 inches) in a pristine mountain stream environment. Rivers Edge Outfitters manages these private streams with fishermen regularly catching browns and rainbows up to 30 inches. If that isn’t enough, there are hundreds of miles of cold water streams within a 30-minute drive of our shop. At Rivers Edge Outfitters we offer some of the greatest private water in the entire southeast. This is great water about an hour away from our Cherokee, North Carolina location, located near Clarkesville, GA. This water is approximately 1 mile of the finest trout fishing in the entire Southeast United States. Rainbow, brown, and golden trout roam this stream. Fish in excess of 25 inches and 8 pounds are common at Rivers Edge on the Soque. The Soque River is known Worldwide to produce absolute giant trout. The guides at Rivers Edge Outfitters really know how to put you on giant, trophy fish. Once you have fished our private water you will be begging to come back. Click here to book your trophy trout trip with Rivers Edge Outfitters to the Soque River today! Advance reservations are encouraged; however we will try to accommodate last minute reservations. A 50% deposit is required on all trips. Deposits are fully refundable up to 48 hours prior to the trip. Same day cancellations result in full charge. We fish in all weather conditions, rain or shine. Weather conditions can change quickly , we work with the client to determine the best possible option for a successful trip. Trips can be rescheduled if weather conditions are not suitable for fishing. Call us for reservations or you can book online. A friendly, patient experienced guide, local transportation, beverages, fly rod and reel, breathable waders and boots, all terminal tackle, and flies. A freshly prepared stream side meal accompanies all full day trips. Lunch can be supplied on half day trips for an additional $25.00 for our gourmet lunch. Fish, we practice catch and release. Fishing license can be purchased at any of our shops. A gratuity for your guide is greatly appreciated. Just like a restaurant, a 15-25% gratuity is customary. Absolutely everything else is provided! What should you bring? Rain gear, polarized sunglasses, a hat, sunscreen, and a camera. All items are available in our store. When fishing with children please bring extra clothing. In the winter it is best to layer and bring an extra change of warm socks.